Lack of activity has a cost, too. The Centers for Disease Control and Prevention estimates that childhood obesity has more than doubled in children and tripled in adolescents in the past 30 years. In 2010, more than a third of American children were obese or overweight. Those figures may be compelling for parents, but Bryant noted that kids need to be motivated in a different way. "It's hard to tell a kid that you need to get out there and compete because it's going to decrease your chance of having diabetes 30-40 years from now," he said. "No kid wants to hear that." What Clinton and Bryant seek is a middle ground between raising a generation of kids who don't care about winning and those who care about nothing else. The benefits extend beyond health: Kids who participate in organized sports gain confidence while learning leadership and how to follow directions as part of a team. Team sports teach skills that translate from the locker room to the board room, and are especially important for helping young girls become power women in male-dominated industries. 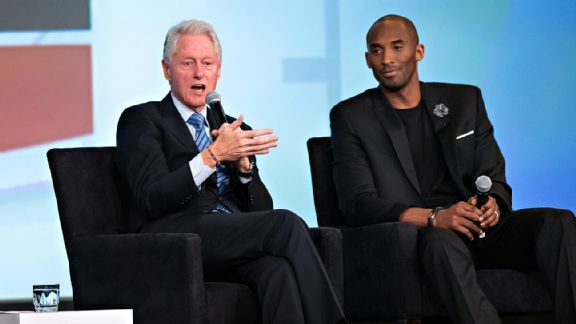 So bill wants kids to be like kobe ? But he clearly says he wants kid's to have Kobe's competitive spirit. Kids don't have wives. Men do. And it's "their". ^ I get where you're going with that, but unfortunately the harsh reality in our society is that some kids do actually have wives.